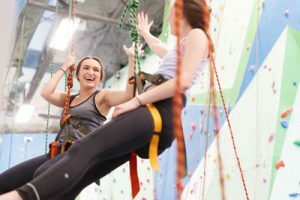 Conquer new teambuilding heights with an indoor rock climbing challenge at Basecamp Climbing, the city’s newest, and tallest, scale-a-wall gym. Over 100 different climbing routes stretch out across the 7,000 sq. ft. of climbing surface. White, green and blue colour blockings signal every angle change and make for a stimulating backdrop to climb on. The walls, some reaching nearly 40 ft., offer climbs for all skill sets. Each route sports a fun moniker, with some names like Glory Hold and Tight Crevasse giving a cheeky nod to the building’s previous history as an adult movie theatre. Climbing is a unique team bonding activity with physical and mental elements that cross-apply to corporate culture, from learning new skills together to teamwork built on collaboration, trust and accountability. Varying instructor ratios for each corporate package are designed to make the most of your time on the ropes while keeping your team safe and engaged. Packages range from recreational climbing to the works which includes an introductory lesson on harnessing, rope management, knot tying, belaying and basic climbing technique along with customized team challenges and games that focus on problem solving, goal setting and strategizing. Coordinate with the gym’s adjacent Black Rock Coffee for adrenaline-boosting bevvies, snacks and an intimate after-climb debrief (Café capacity: 30), or bring catering in for a post-climbing party on the gym’s mezzanine level overlooking the action below (Capacity: 100).